SMH: Uber has apologised to the family of a women in the US who is believed to be the first pedestrian killed by a self-driving car. Police say the vehicle was in “autonomous mode” with an operator behind the wheel when the accident occurred. This incident in unquestionably tragic, but it should not prompt a kneejerk reaction against autonomous vehicles. Despite this high-profile event, the primary argument for driverless vehicles is safety. Self driving vehicles - or Autonomous Vehicles, AVs - will be in the mainstream in about ten years (... I have an essay THE FUTURE in my book en.light.en.ment). They will dramatically alter society, as is pointed out in the series of articles in The Economist: Reinventing Wheels - Autonomous Vehicle Technology - Selling Rides, not Cars - The New Autopia - A Different World - Rules Of The Road. The public seems to be concerned about mainly three aspects of AVs on the road ... there is a perceived ethical dilemma: If there is a choice, would an AV hit a group of children (with little damage to the car) or hit a wall, where the car could be destroyed? People working in the field say such a question does not reflect the real world ... the best course of action will always be to hit the brakes. Then there is the worry about cyber attacks. AVs are essentially computers on wheels that could be remotely hijacked or sabotaged. Engineers say they take the threat very seriously, but point out there are multiple redundant sensors and control systems that will make an AV infinitely more safe than a conventional vehicle; If any part of the vehicle starts to behave strangely, it will stop. "It's easier to use an ordinary vehicle to kill people than to take control of a driverless car." One other concern is congestion. AVs will enable many more people to use rides - the disabled and aged, children, anyone who's been drinking too much - and there will also be many delivery vehicles on the road. But careful pricing of roads and rides should be able to prevent congestion. Many cities already have congestion-sharing schemes of various kinds, or rules that encourage ride-sharing, such as dedicated car-sharing lanes. That interplay will ensure we don't end up with congested roads. EVERY DAY AROUND 10m people take an Uber. The company has made ride-hailing commonplace in more than 600 cities in 82 countries. But the Volvo XC90 picking its way through traffic on a wintry morning in Pittsburgh is no ordinary Uber. Climb into the back, and you will see a screen mounted between the front seats, showing a digital representation of the world around the car, with other vehicles, pedestrians and cyclists highlighted as clusters of blue dots. Tap the screen to say you are ready to leave, and the car starts to move. But no one is driving it. This Uber is an autonomous vehicle (AV)—a car that can drive itself. Admittedly, Uber’s self-driving robotaxi has a human sitting in the driving seat, but only to take over if something unexpected happens. The car drives carefully but confidently in downtown traffic and light snow, handling four-way stops, traffic lights and pedestrian crossings with aplomb. It even knows how to deal with drivers performing the “Pittsburgh left”, a local custom that allows the first vehicle at a traffic light to turn left in front of oncoming traffic. The most noticeable difference from a human driver is that the vehicle makes no attempt to avoid Pittsburgh’s notorious potholes, so the ride is slightly bumpy at times. The engineer in your correspondent’s robotaxi takes over occasionally, for example to guide the car through roadworks where the lane markings have recently been changed. Autonomous vehicles are not yet quite ready to operate without human supervision, then. But they have made rapid progress in recent years, and can now be seen on the roads in several American cities, easily identified by the clusters of sensors on their roofs. Uber’s robotaxis ferry riders around in Pittsburgh and Phoenix. Waymo, Google’s self-driving car unit which is now a separate company in the Alphabet family, has gone a step further, operating autonomous minivans in Chandler, a suburb of Phoenix, without safety engineers in the driving seat. It plans to launch a commercial ride-hailing service there this year. 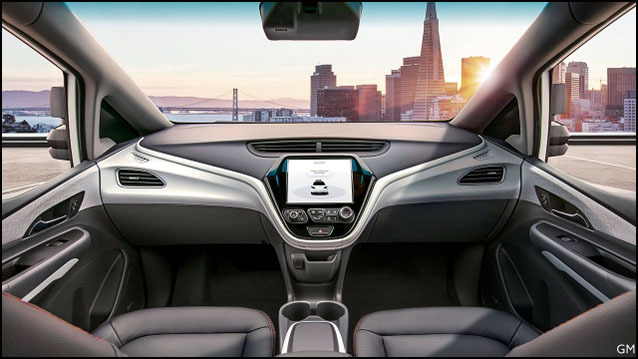 GM, America’s biggest carmaker, hopes to launch a robotaxi service in 2019 using autonomous Chevy Bolt cars that do not even have steering wheels or pedals. AVs operated by tech giants, startups and established carmakers can also be seen around Silicon Valley and Pittsburgh, America’s two main hubs of the emerging industry, drawing on talent from Stanford and Carnegie Mellon universities respectively. In other parts of the world, driverless shuttles ferry passengers on university campuses, in business parks or along special bus lanes. AVs stole the show at CES, the world’s biggest technology fair, in Las Vegas in January. Suddenly, it seems, everybody is jumping on the driverless bandwagon. Recent progress in computer vision and other machine-learning systems is one reason. Tech folk from chipmakers to software firms see AVs as a lucrative new market for their products. Within the automotive industry, the rise of Uber and other ride-hailing services caused a “massive shift in perception around 2015”, says Sebastian Thrun, a pioneer of AVs at Stanford who led the development of Google’s first self-driving car. Carmakers realised that they needed to take AVs seriously—because they will redefine their industry. “Once the car becomes autonomous, the relevance of car ownership drops materially,” says David Lesne of UBS. His firm predicts that robotaxis will take off rapidly after 2025, with 80% of people using them in cities, where available, by 2035. BCG, a consultancy, reckons that by 2030 a quarter of passenger-miles travelled on America’s roads will be in shared, self-driving electric vehicles, reducing the number of cars on city streets by 60%, emissions by 80% and road accidents by 90%. Though some people will want to own their autonomous cars, about half of AVs will be shared robotaxis, says Nikolaus Lang of BCG. Globally, the “passenger economy” created by the convergence of autonomous vehicles and ride-hailing will be worth $7trn a year by 2050, says Strategy Analytics, a consultancy. Carmakers, technology giants, startups and ride-hailing firms are already engaged in a furious battle to dominate this emerging industry. The carmakers understand metal-bashing, but know less about complex software. The tech firms know about machine learning and computer vision, but not making cars. The ride-hailing firms, for their part, have their apps installed on millions of users’ phones, providing the obvious route to market. The result has been a flurry of deals, much hedging of bets and a constantly evolving web of alliances (see chart). Intel, a chipmaking giant, bought Mobileye, a maker of autonomous-driving systems, for $15.3bn in March 2017. GM bought Cruise, an AV startup, for $1bn in March 2016, set up Maven, a car-sharing service, and invested $500m in Lyft, Uber’s main ride-hailing rival in America. Ford fired its CEO in May 2017, partly in response to concerns that the firm was falling behind in electric and autonomous vehicles; it is now investing $1bn in Argo, an AV startup, and also has an alliance with Lyft. Delphi, a big partsmaker, bought nuTonomy, an AV startup, for $450m, and has since reinvented itself as an AV company called Aptiv. Uber recently agreed to buy 24,000 self-driving cars from Volvo, for use in its robotaxi fleet; it also has a partnership with Daimler. For its part, Daimler has been buying up ride-hailing services across Europe and the Middle East that compete with Uber, and also owns a car-sharing service. Volkswagen, Europe’s biggest carmaker, has struck a deal with Aurora, an AV startup founded by veterans of Google, Uber and Tesla. And so on. In short, the tectonic plates of technology and carmaking are colliding, heralding a carquake. This seismic shift will transform both industries, and its aftershocks will be felt far and wide: AVs will be as transformative a technology as the smartphone. Just as cars reshaped the world in the 20th century, in ways good and bad, AVs could change how people live, work and play. They could dramatically reduce the number of road deaths, the time spent sitting in traffic and the space wasted on parking. In urban planning, AVs provide “a great opportunity to address a lot of problems at the same time”, says Joel Kotkin, an urban-studies expert at Chapman University in Orange, California. “If the 20th century was about cars giving us independence, the 21st will be about autonomous vehicles giving us independence from cars,” says Justin Erlich, head of policy for AVs at Uber. But just as cars had unexpected side-effects, AVs are raising new concerns about safety, cyber-security, liability and inequality. “Autonomous vehicles will open a Pandora’s box of unintended effects,” says Peter Norton, a social historian at the University of Virginia. A century ago cars promised to provide safe, fast and congestion-free transport. The similarities with the claims now being made about AVs are “eerie”, notes Mr Norton. This special report will assume that the technological hurdles to full autonomy can be overcome. It will consider the implications of AVs for personal mobility, car ownership and carmaking, but will also look at the wider economic, social and cultural knock-on effects. How will everyday activities be transformed? How could AVs reshape cities? And what lessons does the rise of the car in the 20th century hold for driverless vehicles in the 21st?